Grace came to me with her "magic drawing tablet" and said, "Daddy, look look! 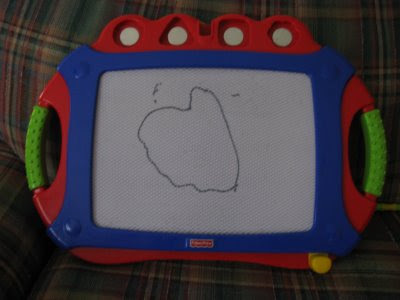 I drew a heart because I love you!" What could I say? It looks darn fine to me! Hi! My daughter was just diagnosed with craninosynostosis and we are in the process of trying to choose a surgeon - I was just wondering if you would mind sharing a bit more with me about what you found when you were checking out local hospitals (we also in the in So Cal area and were thinking about going with Loma Linda). We would appreciate it very much! Thank you!! Hi I saw your posts and I was wondering if you would tell me more about how you found out about Luke having craniosynostosis. Did you know as soon as he was born or much later? How old is he now? My daughter has Left unicoronal synostosis. Thanks! BTW he looks amazing in all the pictures I can't tell what suture was prematurely closed!